Fire has always been viewed with a sense of mystery and awe. A fire is mesmeric and alluring, perhaps even more so when set within a chimneypiece. One of the earliest myths to explain the presence of fire on earth is that of Prometheus and the creation of man. In Greek mythology as told in Hesiod’s Theogony, the Titan Prometheus modelled Man from clay, and Athena, daughter of Zeus, breathed life into these pottery figures. Prometheus was the youngest of the Titans, yet sided with Zeus during a war between the Titans and Olympians, gaining the favour of the victorious Gods. This goodwill was not destined to last, as Prometheus’ affinity for his earthly creations displeased Zeus. The god demanded a sacrifice from man to the gods from earth’s bounty, and Prometheus cheated Zeus by wrapping bones in fat; saving the meat for man. This incurred the wrath of the Olympian. Whilst Zeus had confined man to earth, and denied them immortality, Prometheus had gifted his creation with the arts, the skill of metalwork, and one final gift, which was to be his downfall. This gift was fire, stolen from the Olympian Gods and concealed in a stick of Fennel on its journey to earth. On discovering this deception, Zeus’s punishment to man was order the creation of the great beauty Pandora; the first woman on earth. Pandora was then gifted to Prometheus’ foolish brother Epimetheus to marry. She was endowed with both beauty and cunning and given a box; full of troubles of the world. She opened it, releasing a swarm of evil spirits and leaving only one thing in the box behind, hope. However Zeus’s punishment for Prometheus was certainly the most barbaric. He sentenced the wayward Titan to an eternity of agony; tied to a rock whilst an eagle perpetually pecked out his liver every time it regrew. 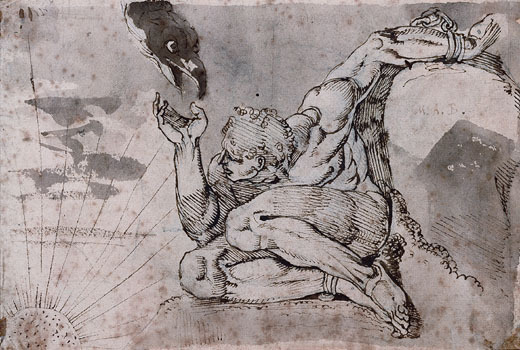 Henry Fuseli, Prometheus, c.1770 Kunstmuseum, Basel. Perhaps it was the clandestine manner in which Prometheus stole fire from the Gods that imbued it with a further sense of enchantment. The Greeks might also have relayed this myth to show how precious a commodity fire is. It is that which can’t be bought, only created, possessing an undeniably ethereal quality. The sense of mystery surrounding the fire continued for centuries. The fireplace has always been a centre of superstition in the home, both used rituals and seen to ward off malevolent spirits. The salamander is a creature cloaked in mystery, and one intrinsically linked to the magical qualities of fire, especially on the continent. This lizard like creature was often said to have emerged from flames for a fireplace unscathed, as if reborn. Of course, we can now understand that the Salamander was in fact hibernating in the logs. However this legend endured and its imagery was linked to the eternal and immutable, used as an emblem by the French Royal Family as a symbol of these traits. In medieval England, the shape of cinders on the hearth was said to foretell events that would occur in the house – such as a birth or a death. It was also said that if your fire won’t draw properly then a witch may be sitting on your chimney, in which instance you must run outside and shoo her away! In order to prevent witches flying down the chimney, people would scratch Witches Marks (also known apotropaic marks) – often crosses and circles – to deter them. These marks can still be found, especially over inglenooks and entrances. Many of these myths and legends have been swept away in modern times, but evidence of them, such as apotropaic marks and the emblem of the salamander, remain.